Despite a weather forecast for snow later in the day there was still a good turnout of exactly 100 cyclists for the 14th Charlie Westlake and Walter Pilkington Sportives – 62 for the 100km ride and 38 for the 50km. The total money raised for the two charities – Bury Hospice and Cancer Research UK – was an amazing £727.00. Thank you to all entry fee paying riders and other contributors for this success. 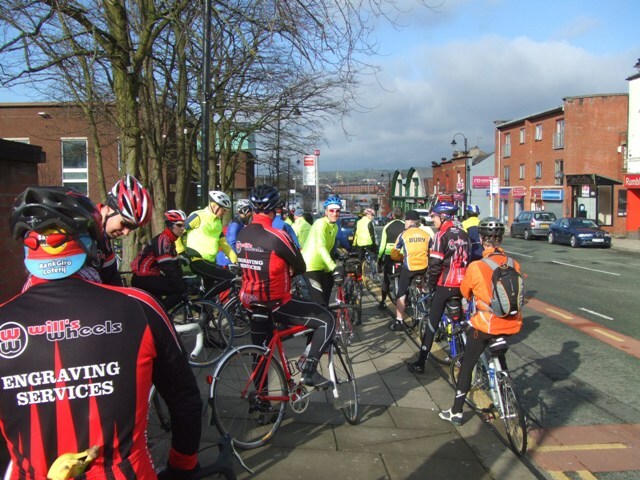 Since its inception in 2002, a year after the death of Charlie Westlake, the 50km memorial ride has taken place annually organised by Bury CTC in association with Bury Clarion. When Walter Pilkington died in 2009 we introduced the 100km event. The best supported year was 2013 when a total of 136 riders participated raising £804 for our charities. With the “Wiggo effect” and the rise in popularity of cycling and cyclosportive events we have found the numbers of riders difficult to manage with insufficient volunteer helpers coming forward, particularly this year. With larger groups of riders participating, Health and Safety becomes more of an issue for organisers. In a way, we have been a victim of our own success and although the entries have decreased in number for the last two years, next year we plan to scale down to a more manageable memorial reliability ride. This year it was business as usual. It was dry but windy and cold as riders gathered early Sunday morning for registration at Castle Leisure Centre. 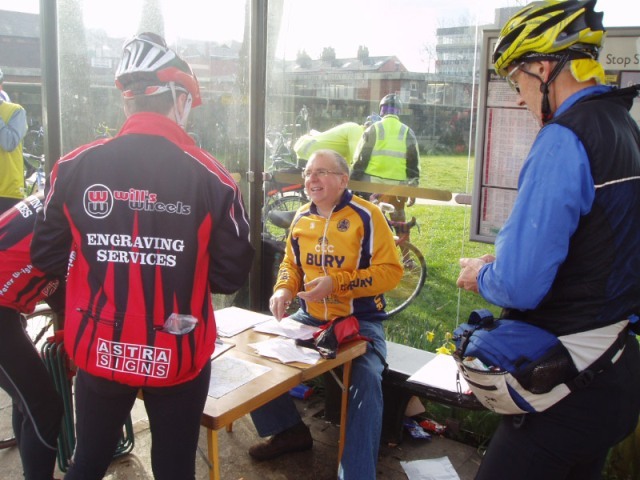 Organiser John Butterworth manned the 100km desk with his Bury CTC club colleague Paul Jarvis next to him on the 50km desk. As for the last few years, Peter Roscoe set the riders off in small groups in the direction of Ainsworth in a very orderly fashion. A strong headwind was encountered on the outward leg up to Belmont where the first control at the reservoir layby was manned by the ever dependable Frank Jefferson. After the riders rolled through Tockholes (some stopping at the café), Lower Darwen and Guide they came across the equally dependable team of Phil and Vera Rigby manning the control at the Britannia roundabout. It is here that the riders of the 50km and 100km events bid farewell to each other and go their separate ways. Those on the 50km ride are directed over the Roundhills road towards Haslingden and continue through Ewood Bridge and Edenfield and the final climb up to the finish at Owd Betts. The 100km riders, having been told at the start that the usual controls at Downham and Waterfoot had been cancelled due to lack of volunteers, turned towards Blackburn and after a short spell on the ring road rode through York village, Whalley, Clitheroe, Chatburn and Downham to start the long climb flanking Pendle Hill. After descending to Barley some made a stop at the Clarion clubhouse near Roughlee where Charlie’s memorial seat is situated outside. After this they started on the homeward leg through Fence, Burnley, Towneley Hall and the long climb towards Bacup before turning right and dropping into Waterfoot on a dangerously bad road surface. Then Rawtenstall, Edenfield and up to the finish at Owd Betts. Although there was an early headwind and it was windy and cold all day, the one blessing in increasingly wintry conditions was a tailwind for the final climb. Not only that, but it was dry for the entire 50km ride. However, many of the 100km riders arrived bedraggled and dripping water over the pub carpet after encountering rain, sleet and even snow for the final miles. There was much banter and cycling camaraderie displayed in the warmth of Owd Betts lounge as riders checked in at the finish control manned at first by John and, later on, Peter Roscoe. Although not a race and therefore a ‘results’ sheet has not been produced this year, it is always interesting to note the times of those who finished the fastest. 15 years old Jake Wright had a superb ride finishing the 100km ride well ahead of most of the others in an amazing 3 hours 17 minutes which is a record for the route. He was nearly caught by Michael Humphrys who finished second just eleven minutes later. Both riders were well within the seven hours time limit. So much so that they could have ridden round twice! The headline could have been ‘Extraterrestrial’. Eight other riders finished in under four hours. These were George Greenhalgh (third in 3 hours 30 minutes), Joseph Cadwallader, David Stammers, Jon Longworth, Greg Punshon, Adrian Hughes, Chris Taylor and Tony Crowther. First home on the 50km ride was Gavin Wright (father of Jake) in 1 hour 50 minutes – another course record. Next home, just six minutes later, was John Harrison. Both these riders could also have completed their course twice as the time limit for the 50km ride is four hours. There were just 10 non-finishers on the 100km ride and just one on the 50km ride. And thankfully there were no reports of any serious mishaps. All finishers fully deserve their certificates. Finally, a thank you to all those who helped in the smooth running of the event, including staff at Castle Leisure Centre. SOME PHOTOS TAKEN AT THE START. The 2015 event - the 14th in succession - will be the last. 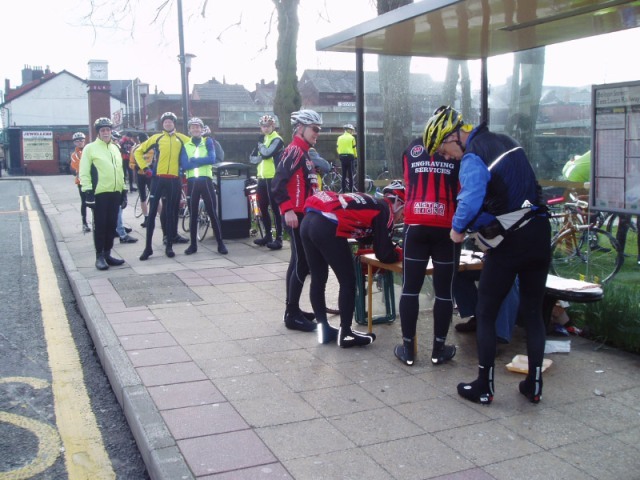 From a small scale reliability ride in 2002, the event has grown to a larger scale Sportive (with a low entry fee to reflect the lack of signage, refreshments and timing etc). In the interests of safety, more helper volunteers are needed to cope with this increase in popularity. These have not been forthcoming so from 2016 it is intended to revert to a memorial reliability ride format over the 50km route. Watch this space after 2nd February. But for 2015 we were still very much on. The rides commemorate two past Bury cycling club stalwarts Charlie Westlake and Walter Pilkington. The 100km event is named after Charlie and the 50km commemorates Walter. There will be two registration check-in desks in the Castle Leisure Centre foyer which open at 9am. The 100km ride will set off first at 9.30am and the 50km ride will start at 9.45am. It is an 'open' event i.e. open to all cyclists whether club members or not. All under 15s must be accompanied by an adult. All under 18s must provide written parental consent at registration (bottom half of entry form). It is up to the entrant to record his or her time for the ride. There will be space on the certificate for the time to be filled in. 2015 Entry Forms posted below. Please complete and bring with you. So, scroll down and click on the link below and print off an entry form for you to complete and bring with you to the start to save time at the registration desk. To find out more about Charlie and Walter go to their pages on this website. Fine weather Friday, fine weather Saturday, rubbish weather Sunday, fine weather Monday. Guess which day the Charlie Westlake and Walter Pilkington Sportive Bike Rides took place? Frustrating though that was, it didn’t put off 47 cyclists from entering the 50km event and 75 cyclists entering the 100km event – a total of 122 riders. 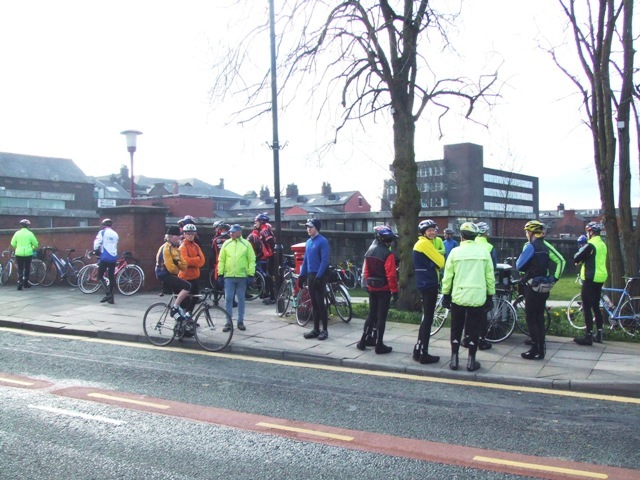 Since 2002 Bury Cyclists’ Touring Club with Bury Clarion have organised these rides in memory of two of Bury’s cycling stalwarts of the past to support Bury Hospice and Cancer Research UK. Over the years, in line with the growth in popularity of cyclosportives and the Olympic and Tour de France successes of British riders, the event has got bigger. Weather conditions ensured that numbers were slightly down from last year, but the 2014 event was still the second best supported ever. Our two controllers at the registration desk in the foyer of Castle Leisure Centre (John Butterworth and Paul Jarvis) had to speedily process the entry forms and get riders signed in. This year we had more helpers at the start than usual including ‘official photographer’ Mike Tattersall and Nigel Blandford. With a minimum entry fee of £3 it is pleasing that, including additional donations, we managed to raise £770 which will be split between Bury Hospice and Cancer Research UK as usual. Outside the leisure centre Bury Clarion’s Peter Roscoe was marshalling the riders ready for the start. By bringing all his experience to bear, he again managed to control this and safely got the 100km riders on their way at 9.30 and the 50km group fifteen minutes later. Next to encounter the huge influx of riders at their control was Phil and Vera Rigby at the Britannia roundabout - the 31km point. All riders having covered the same route so far, it is here where they split; the 50km riders turned right to head over Roundhills (into the wind) towards Haslingden whilst the 100km riders turned left and swept downhill towards Blackburn. Mark Cranshaw was scheduled to marshal at the Assheton Arms in Downham which serves as the third control at the 56km point. Mark was at the event start and some riders didn’t see him at the Control. I’m sure he made it there but no communication was received. Terry Hodges manned the control at the Duke of Buccleugh pub in Waterfoot just 10km from the finish. Terry, wanting to put something back into cycling having experienced the sterling work done by marshals at last year’s London-Edinburgh-London event and many others, provided refreshments in the way of drinks, Jaffa Cakes and many other goodies. For those having survived the tough climb into a headwind from Burnley to Crown Point prior to their descent to Waterfoot, Terry’s refreshments were very welcome indeed. Organiser John arrived at the finish control (Owd Betts pub) just before 12 noon just as the first 50km riders were approaching. When the pub doors opened, John took his place for a long stint at welcoming riders in from both events and providing them with their well-deserved certificates. Once again John was entertained by banter from club mates enjoying a few pints after their ride. Which helped take his mind off the cold draught that swept through the pub every time someone opened the door. With such a number of riders participating there were a few stories of riders taking the wrong direction or misreading the route sheet, and of course the inevitable punctures. One rider set off riding a fixed wheel bike with just a front brake – which failed when the cable snapped on a descent! There was a report of more than one snapped chain near Belmont. Thankfully the vast majority of riders had a trouble free day in the poor conditions and nevertheless enjoyed the scenery and challenging climbs on both routes. This year we had eight female riders taking part. A glance at the ‘results’ sheets will show that riders came from all over the region and beyond to participate including tandem pair Graham and Vicky Payne from Wales and riders from Barrow in Furness and Liverpool. Despite the poor weather, out of the 122 riders only 16 did not finish – 3 from the 50km event and 13 from the 100km event. Thanks to all the riders for making the event a big success from a cycling point of view and for the amount of money raised for our charities (£770). A big thank you to the marshals and helpers who make it all possible every year. Thanks also to Castle Leisure Centre staff who are always very helpful in setting up the registration desks and allow us to take over their foyer for an hour or so every year. And finally, thanks to Reece at Owd Betts for allowing us to use his pub for the finish. Good weather with a dry day in prospect, perhaps combined with the ‘Wiggo Effect’, ensured a record turnout for our annual Sportive Bike Rides held in memory of Bury cycling personalities Charlie Westlake and Walter Pilkington. For the 100km event we had 87 entrants and for the 50km event a total of 49 signed on. Our two controllers at the registration desk (John Butterworth and Paul Jarvis) in the foyer of Castle Leisure Centre had to process 136 entry forms in just over half an hour. Somehow it was done but at one point concerned leisure centre staff were worrying about their crowded foyer. Next year we will need a foyer marshal. With a minimum entry fee of £3 it seems incredible that with additional donations we managed to raise £805 which will be split between Bury Hospice and Cancer Research UK. Outside the leisure centre Bury Clarion chief Peter Roscoe (or so he has been dubbed by the Bury Times) was marshalling the riders ready for the start. By bringing all his experience to bear he managed to single-handedly control this and safely sent the 100km riders on their way at 9.30 and the 50km group fifteen minutes later. The first checkpoint was near Belmont, but with many riders treating this as a true sportive and riding well beyond touring pace many went through before our marshal, Frank Jefferson, was in place. Thankfully most had read the route sheets well and carried on without a problem. Later, on his way home, Frank encountered some riders on their way back from Darwen! They had lengthened their ride somewhat by missing the left turn up to Delph reservoir and continuing up the A666. I always advise riders to thoroughly get to know the route in advance by studying the route map and route direction sheet prior to setting off. Good advice if I say so myself. Next to encounter the huge influx of riders at their control was Phil and Vera Rigby at the Britannia roundabout - the 31km point. Again some had ridden through before they had arrived, but four hands are better than two and the twosome did a sterling job in checking in the vast majority of riders and sending them in the right direction. All riders having covered the same route so far, it is here where they split; the 50km riders turn right to head over Roundhills towards Haslingden whilst the 100km riders turn left downhill towards Blackburn. Mark Cranshaw was on his annual marshalling pilgrimage to the Assheton Arms at Downham which serves as the third control at the 56km point, but even he had missed a few of the riders as they had sped through before his arrival. New volunteer Derek Coupe was manning the control in Waterfoot just 10km from the finish and it was the same story here. A baptism of fire for Derek. The landlady of the Duke of Buccleugh pub kindly made Derek a brew and allowed riders to use the pub toilets. I will write to thank her. In Edenfield Walter’s widow and past tandem partner Norma Pilkington was spotted at the roadside encouraging the riders on prior to their final climb up to Owd Betts. John arrived at the finish control (Owd Betts pub) at 12.10pm and already there were some 50km riders present ready for him to check them in and award them their certificates. Needless to say we will be reviewing the control times for next year’s event. Having said that, Owd Betts doesn’t open until 12noon so no one will be there before that. Or are there any volunteers willing to stand outside on a freezing windblown moorland summit? Form an orderly queue please. Whilst checking riders in at the finish throughout the afternoon in the warmth of Owd Betts lounge John was entertained by the usual banter from club mates enjoying a few pints after their ride. With such a number of riders participating there were a few stories of riders taking the wrong direction or misreading the route sheet, and of course mechanical problems ranging from a broken spindle to the inevitable punctures. Thankfully the vast majority of riders had a trouble free day in pretty good cycling conditions for the time of year and enjoyed the scenery and challenging climbs on both routes. Special mention goes to our new 15 year old member Ryan Harrison who rode the 100km event and finished well within the time limit. It is nice to see a young lad so keen on his cycling. Even younger was 13 year old Jake Wright who rode the 50km event with his dad Gavin and finished in an excellent 2hrs 15mins. This year we had seven female riders taking part in the 50km event, and Pauline Cooper with her tandem partner David Lowe completed the 100km – the only tandem entrants of the day. A glance at the ‘results’ sheets will show that riders came from all over the region and beyond to take part – some from Liverpool. This is very encouraging and we will work towards improving the event for next year. And now to thank everyone. Thanks to all the riders for making the event a big success from a cycling point of view and for the amount of money raised for our charities. I’ll repeat it was £805 this year. A big thank you to the marshals and helpers who make it all possible every year. And finally thanks to Castle Leisure Centre staff who are always very helpful in setting up the registration desks and allow us to take over their foyer for an hour or so every year. The three pictures below were taken at the start of the 2013 event. 46 riders braved the wet and cold conditions and turned out to take part in the annual Charlie Westlake and Walter Pilkington Cycle Sportives on Sunday 4th March raising a grand total of £390 to be shared between Bury Hospice and Cancer Research UK. With equal numbers starting both the 50km event and the 100km event (named after the late Bury CTC Section Presidents Walter Pilkington and Charlie Westlake respectively) the day was considered a success by all who completed the rides and received their well earned certificates at the finish. Weather conditions were much worse than last year when we had a record turnout of 89 riders, so the satisfaction in completing the rides was all the greater. Both routes are challenging with plenty of hills to tackle and a hill top finish at Owd Betts. The 100km event has 1,898 metres of climbing with Pendle Hill above Downham being the biggest obstacle. John Butterworth and Jordan Cottrell manned the registration desk in the Castle Leisure Centre foyer, issuing each rider with a route sheet and number. 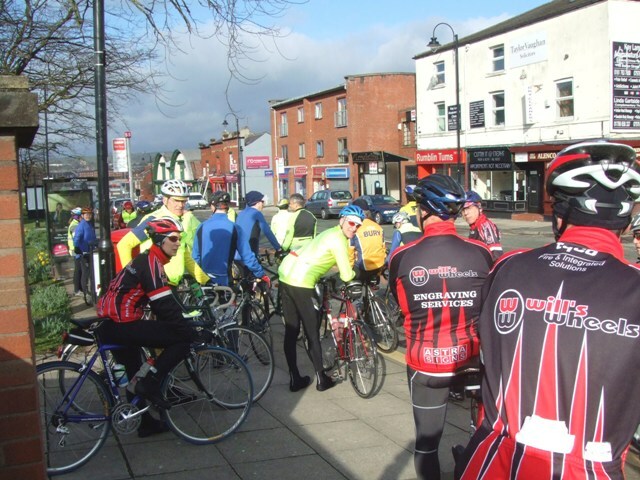 The event was first run in 2002 as a memorial invitation ride for Bury cycling legend Charlie Westlake who had passed away the previous year. Numbers have steadily increased over the years with a dip this year due to the weather (we hope). 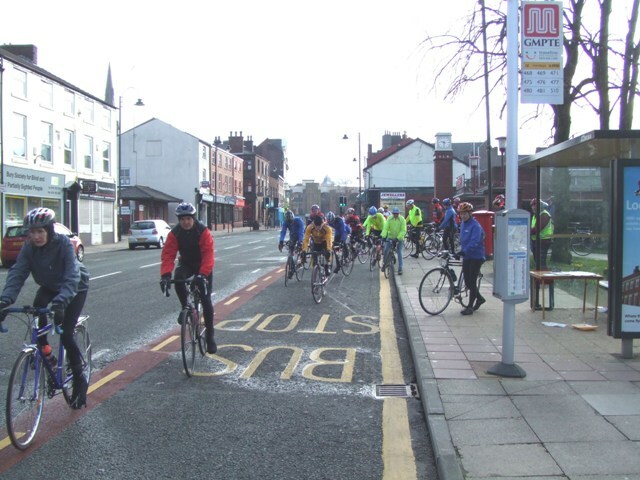 Again there was two start times to avoid the potentially dangerous situation of a large group of cyclists all setting off down Bolton Street together. Although not as bad as the conditions encountered in 2009 when hail and sleet decimated the field on Belmont, the low temperature, light rain and a north westerly wind meant that winter wear was definitely needed, even though the weather forecast was for an improvement later (it didn’t improve very much). This was all the more galling as the weather the previous few days had been positively spring-like. As a matter of interest, although this was not a race or speed competition, the record time for the 100km event is 4 hours exactly, and for the 50km event 2 hours 10 minutes. These times were not expected to be beaten in this year’s weather. Entries from outside the region included Alexander Venables from Wiltshire (Phil and Vera’s visiting son-in-law) and more locally, apart from the Bury and Bolton region, riders came from Atherton, Worsley, Oldham, Flixton, Swinton, Stalybridge; and Peak Audax and Manchester & District CTC secretary himself, Mike Wigley, rode in from Delph to participate in and complete the 100km event. Disappointingly there were no lady entrants this year. Quite a few CTC members had entered to earn points for the annual CTC Tourist Competition of which ours is a qualifying event. Most unfortunate rider of the day was David Trippier who suffered a broken stem which put a halt to his ride. Bury Clarion’s Bob Duckworth set off with what looked like a deflating front tyre but overcame it and completed the 50km event anyway. One or two other riders had a few problems with directions not helped by the difficulty in reading route sheet and map in the rain. A total of 7 riders did not finish, which means that 39 did. Marshalls Frank Jefferson and Donald Lever at Belmont and Phil Rigby at the Britannia roundabout above Blackburn had to check through the riders participating in both events until the routes separated at Phil’s control. Mark Cranshaw once again checked the 100km riders in at Downham (even after turning up at the start), and new member Dean Cunningham did a great job marshalling outside the Duke of Buccleugh pub at Waterfoot. John Butterworth checked all the riders in at the finish control in the warmth of the Owd Betts pub interior. A big thank you to all marshalls for giving their time. Thanks also to the staff at Castle Leisure Centre and Owd Betts for accommodating us at the start and finish. I think every rider, in a masochistic kind of way, enjoyed the day. Let’s hope for better weather in 2013. Click on the link below to see a list of riders and their times. Two participants turning into Owd Bett's car park at the end of their ride. A record 89 nine riders set out on the annual Charlie Westlake and Walter Pilkington Cycle Sportives on Sunday 6th March 2011 raising a grand total of £500 to be shared between Bury Hospice and Cancer Research. With 46 starting the 50km event and 43 the 100km event (named after the late Bury CTC Section Presidents Walter Pilkington and Charlie Westlake respectively) the day was considered a success by all who completed the rides and received their well earned certificates at the finish. There was light cloud with blue sky peeking through for the start and the prospect of sunshine later; however winter wear was definitely in order at this early part of the year when winter tries to fight off the approach of spring. Notable among the entries was Chris Heap and his young son Bradley on a bike and trailer. They finished the 50km ride in the very creditable time of 3 hours 2 minutes. Entries from outside the region included Nigel Tottie from Haxby, West Yorkshire, Nigel Dawson and Shane Seiga from Merseyside, John Ramsden from Burnley, Kevin Parr from Wigan and Tatjana Troll from Chorlton. This time no representatives from North Wales as in the last two years and alas only five ladies were present - and all in the 50km event. We hope to see more lady entrants next year. Quite a few CTC members had entered to earn points for the annual CTC Tourist Competition for which we are now a qualifying event. Click below to see the results sheet. Visit the 'Photo Gallery' to view some photos. A cloudless, bright but very cold early Sunday morning attracted a good turnout of 71 riders to participate in the 9th annual Charlie Westlake Sportive bike rides on 7th March. 43 cyclists opted for the 50km route and 28 for the 100km route. Compared to last year’s event the weather was ideal with very little wind and a gradual increase in the temperature. Frank Jefferson manning the first control near Belmont reservoir did a great job in checking through all 71 riders from only 45 minutes into the event. Peter Roscoe at the second control at the Britannia roundabout had to ensure that riders departed in the right direction as it is here that the 100km riders go one way towards Blackburn and the 50km riders go another towards Haslingden. 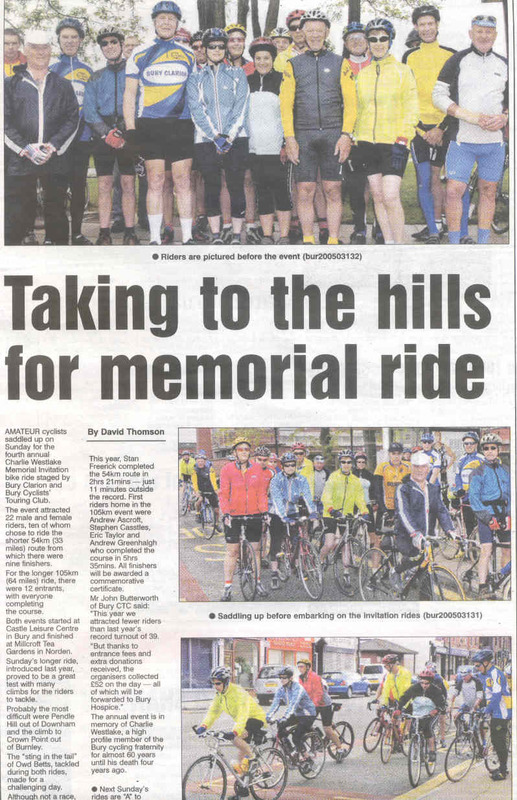 Thanks to entry fees and contributions from the riders we managed to raise £403 for Bury Hospice. Apocalyptic would be a good word to describe the weather which developed shortly after the start of the 2009 Charlie Westlake Sportive Bike Rides on Sunday 8 March. Organised by Bury CTC with Bury Clarion, the scene at the start of the 50km and 100km rides was promising. A best ever turnout of 46 riders including some from as far away as North Wales and Merseyside signed on in dry and bright conditions. After a prompt 9.30 start from Castle Leisure Centre the riders rode up to Ainsworth and Egerton before hitting the climb to Belmont reservoir. It was here that the wind strengthened and skies opened bringing horizontal sleet for the riders to contend with. Frank Jefferson, the marshall at the first control, wisely stayed inside his car to register the riders through. The cyclists pressed on but the temptation of the excellent cafe at Tockholes weakened the resolve of many and there was a mass abandonment of almost half the entry here. On completing his control duties Frank came to the rescue of a young rider who punctured and adandoned. Frank kindly loaded the lad and his bike in his car and drove them home. A big thank you to Frank from Brandon Wilkinson and his family. Meanwhile the surviving riders made of sterner stuff continued and braved the conditions which did improve slightly as sunny spells developed in between the blustery wintry showers. Joanna Stevens is to be commended for completing the 50km ride wearing fingerless gloves. New junior Bury CTC member Jordan Cottrell finished the 100km event strongly despite a crash before the start and a slow puncture towards the end. There was only 9 finishers from 22 starters of the 100km in 7 hours ride which took in Pendle Hill, and a healthier 19 finishers of 24 starters of the 50km in 4 hours ride around testing local hills. These included Mandy and Nigel Hood and Vicky and Graham Payne on their tandems. Riders of both distances had the final sting-in-the-tail climb to Owd Betts to the welcome finish line and to collect their certificates. Each finisher could ride home with their certificate with pride. Although not a race, the fastest finisher of the 50km ride was Adam Tucker in 2hrs 35mins. Unfortunately Terry and Susan Gilfoyle tarried too long in the Tockholes cafe and missed the deadline by ten minutes. Fastest 100km riders were Jordan Cottrell and Peter Hardcastle who both finished in an amazing 4hrs 44mins. Despite the weather conditions these riders were so fast that they went through the final control at Waterfoot before it had opened! Strictly speaking they should have been disqualified but how could we have been so cruel on such a day. The first 100km finisher having registered at each of the four controls was Alan Webb in 5hrs 24mins. Last home, but certainly not least, was Mike Heys in 6hrs 15mins. A special thanks to all volunteer marshalls - Frank Jefferson, Mark Cranshaw (who rode most of the 100km route as well as marshalling it at Downham), Jim Holden, Roy Turner and Phil and Vera Rigby. Also to Peter Roscoe for helping out at the start. Through entry fees and riders’ sponsorship the event raised a best ever total of £402 for Bury Hospice, so a big thanks to all entrants - successful or otherwise. For those who didn’t finish, there’s always next year! More photos of the start at Castle Leisure Centre below. The 7th edition of the Charlie Westlake Sportive Bike Rides went well with a turnout of 29 riders (18 for the 100km event and 11 for the 50km). 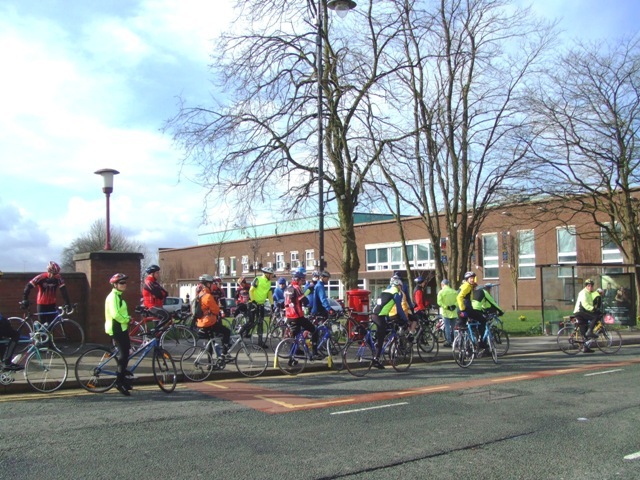 Some local cycling clubs did not support the event in any strength, but this was more than made up by a large contingent of riders from 'Will's Wheels' based in Stockport. One riders came from Milton Keynes! A big thank you to all the cyclists for making the effort to join in the rides. We have raised £125 for Bury Hospice. Also a big thank you to Frank Jefferson, Steve Willetts and Phil & Vera Rigby for taking on marshalling duties. Without volunteers like this the event could not take place. Seventeen riders turned up in light drizzly conditions to take part in the Charlie Westlake Sportive Bike Rides last Sunday to raise money for Bury Hospice. This was an event open to all cyclists – and for the first time we had no female entrants. It is a pity that so few started as the weather forecast proved correct in that it improved during the morning and was perfect by the afternoon. Eleven riders tackled the 100km route over hilly roads to Downham and back over Pendle Hill with the sting in the tail – an uphill finish to Owd Betts. The first group home, including Mark Cranshaw of Bury CTC, crossing the line at 5 hours 15 minutes. It was a brave effort by Howard Marsh but cramp prevented him from finishing. Three other riders also decided not to tackle the final climb. Six riders took on the 50km route including 14 year olds Sam Hesketh and James Lester who finished in a very creditable time of 3 hours and 4 mins – well inside the 4 hours allowed. Each checkpoint around both routes was manned by a volunteer. A big thank you to them. So far £55 has been raised for Bury Hospice. Certificates will be issued soon. The 2008 event will take place on Sunday 9th March. See below for details. The third annual Charlie Westlake Memorial Bike Ride took place on Sunday. 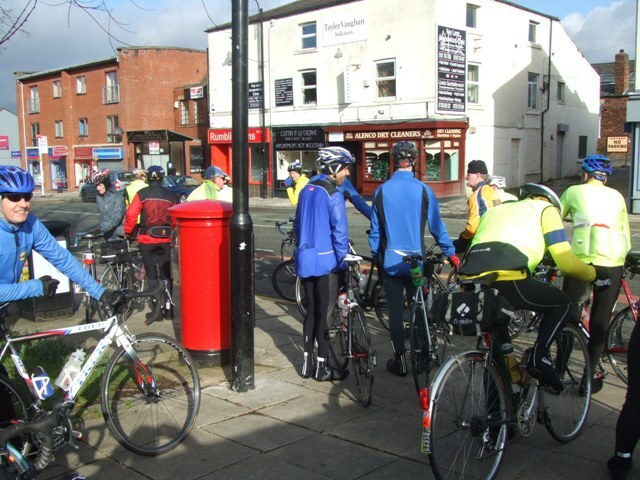 With proceeds going to Bury Hospice, perfect weather and the addition of a longer route, the event attracted 39 cyclists. 15 chose to ride the 54km route and there were 12 finishers. For the longer 105km route there were 24 entrants with 21 finishers. The new longer ride proved to be a great test with many climbs having to be tackled. Probably the most difficult are Pendle Hill out of Downham and that to Crown Point out of Burnley. The ‘sting in the tail’ of Owd Betts before the finish at Millcroft Tea Gardens made for a challenging day. Special mention must be made of fifteen year olds Benjamin Treanor and William Brown who tackled the 105km route – the longest ride they have ever attempted – and completed it in just under six hours. This is a tremendous achievement and should be an inspiration to other young budding cyclists. Although not a race, there will always be riders wanting to go round in as quick a time as possible. This year Martin Saunders completed the 54km route in 2hrs 15mins – just 5 minutes outside the record set last year. First riders home in the inaugural 105km event completed in 5hrs 15mins. The organisers collected £60 on the day which will be forwarded to Bury Hospice. Any successful riders who rode for Bury Hospice should send their sponsorship money to them as soon as they can. Every year this event is growing in stature. Thank you to everyone who participated - your certificates will soon be on their way.